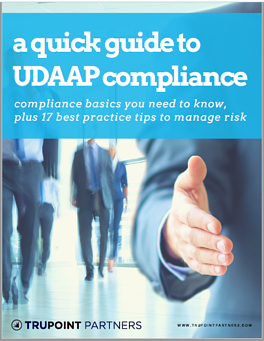 Learn the Basics of UDAAP Compliance with this Free Info Kit! Get clear definitions for UDAAP key terms, best practice tips, and more! Learn key definitions of unfair, deceptive, and abusive, 17 best practice tips that will help you improve your UDAAP compliance, plus much more! Get this free guide today. The percentage of UDAAP violation allegations centering on "deception"; and so much more! >> Fill out the short form to view the UDAAP kit immediately! It's free, and there's no obligation. Yes! Send the UDAAP Compliance Guide.